Hope House, a New York boarding home for women, has led a rather sleepy existence in terms of emergencies. One wastepaper basket blaze surely doesn’t count as a five-alarm fire. That is until new tenant Ruth Miller’s limp and lifeless body is found in the courtyard after plummeting to her death. In a clandestine, hot-chocolate fueled meeting, the heads of the house decide Ruth’s death couldn’t possibly have been foul play: no, she must have fallen or jumped. Shy and mousy, it seems Ruth had no friends to question… or ask uncomfortable questions. But this was no accident: upon Ruth’s arrival, the atmosphere of this happy house shifted, her paranoia was catching, and her last days were filled with dread. If the heads thought a scandal could be averted, they were wrong. It turns out Ruth did have a friend… and she’s out for justice. 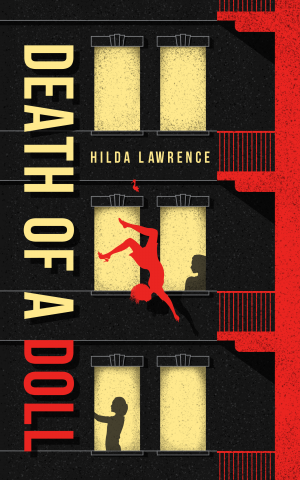 This claustrophobic and tense mystery is heralded as Hilda Lawrence’s best. Equal parts cosy and suspenseful, it’s sure to captivate lovers of all genres of classic crime. Death of a Doll was first published in 1947.